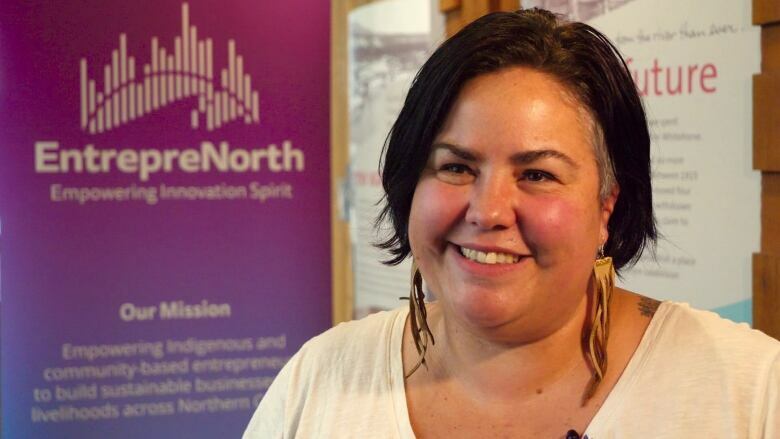 'EntrepreNorth,' spearheaded by the non-profit group Tides Canada, is aimed at Indigenous and community-based businesses in Nunavut, the N.W.T. and Yukon. Kym Rempel of Whitehorse took a soap-making class a few years ago, just for fun. She enjoyed it so much, she soon had her friends in a lather. "Very quickly, all my friends were saying, 'I have too much soap, stop giving me soap!'" she recalled. "So I started selling." Rempel is one of a handful of northerners accepted last fall into "EntrepreNorth," a fledgling support program for entrepreneurs. It's spearheaded by the non-profit group Tides Canada, with a focus is on Indigenous and community-based businesses in Nunavut, the N.W.T. and Yukon. The first cohort of nine people is now in the middle of the six-month program that's taken them to Yellowknife, Iqaluit and now Whitehorse. The program involves some formal training, guest speakers, one-on-one coaching and mentoring, and networking. Rempel says it's been a big help, so far. Her 18-month-old "bath and body company," Anto Yukon, quickly took off when she started marketing online, and she often feels she's just playing "catch-up." "I don't necessarily know all the steps that I need to know, so this program is offering us the opportunity to learn those steps," she said. Another Yukon participant, Joella Hogan, has also started a handmade soap business. Hogan, a member of the Na-Cho Nyak Dun First Nation, runs the Yukon Soaps Company from her home community of Mayo. "I knew it was a reliable product, and that more and more people are wanting to use natural handcrafted soap — and I thought this was a good business to have in my community," she said. She's in EntrepreNorth to learn more about the financial mechanics of running a business. She's also learned a lot about marketing, and finding her product niche. "I have so many ideas, so helping to rein that in has been really important," she said. Both Rempel and Hogan use natural and local ingredients in their soap and body products, and that's a big part of the reason they were accepted into the EntrepreNorth program. Benjamin Scott, the program director, said the idea for this first cohort was to focus on product-based businesses. Other participants include people from Nunavut-based businesses Hinaani Design and UasaU Soap, and N.W.T. businesses Aurora Heat, and Dene Roots. "We've really got a dynamic, diverse group who we're really excited to be working with," Scott said. "For this one specifically, we wanted to really focus in on the idea of businesses that are trying to incorporate local resources within their supply chain." Scott says the goal is to help fledgling entrepreneurs take their businesses "to the next level" — and part of that involves helping them make connections. "There's a lot of magic that happens when you pull together a diverse group of motivated entrepreneurs," he said. "One of the key things that we're finding delivering the program is the connection in the classroom, and the connections between the cohort members, and the sharing of information and knowledge." Rempel agrees, saying northern entrepreneurs often find themselves working with southerners, to source supplies or market their products. Those people don't always understand the hurdles businesses face in the North, such as costs and shipping delays. "There's sort of an explanation piece that you have to give in Southern Canada, about challenges, about ways of doing business, about ways of viewing things, that you don't have to do with other people in the North," she said. "So you can get into things a lot quicker, and you can connect a lot easier because you don't have to go through that whole 'understanding the North' piece." Hogan also appreciates the connections she's made through the program. "I think we're all feeling that the program is too short," she said.